This NASA sky map shows the locations of Mars and the moon in the eastern sky as they will appear on the night of March 7, 2012. Early Wednesday evening (March 7), a brilliant yellowish-orange "star" will be shining above and to the left of the moon, which will officially turn full later that night. But the light is not a star — it's the planet Mars. Mars arrived at opposition on Saturday (March 3) and is now rising just prior to sunset and shining all night. Although only slightly dimmer than the brightest star Sirius, Marswill attract more attention — partly because of its distinctive golden-orange light and also because it beams at us with little or no twinkling, save when it appears low on the horizon. The sky map of Mars and the moon for this story shows where the two objects will appear the evening of March 7. However, observers using telescopes should still wait until late evening for Mars to climb high into a steadier atmosphere. As oppositions go, this is one of the more distant ones; the sixth farthest in the last 100 years. Currently, the Red Planet is about 63 million miles (112 million kilometers) from Earth. The next two Mars oppositions, in 2014 and 2018, should bring the planet even closer to Earth, making it shine even brighter, according to a NASA video. The planet's disk now appears no wider than 13.9 arc-seconds across. An arc second is a unit of measurement for objects in the night sky. There are 60 arc seconds in 1 arc minute and the full moon, for reference, is about 1,800 arc seconds wide. And at least Mars is high in the sky. Currently, Mars reaches a midnight altitude of 60 degrees up from the horizon as seen from mid-northern latitudes. (Your closed fist held at arm's length covers about 10 degrees of the sky) This is higher than any future opposition until December 2022. A patient telescopic observer will get many hours of high and steady Mars viewing on nights of good seeing. Studying any planet means spending a lot of time watching and waiting for brief glimpses through steady air. Just as important, the longer you watch, the better trained your eye becomes; so plan to spend lots of time at the eyepiece. Mars' northern hemisphere is tilted far Earthward now, giving us a fine view of the north polar ice cap as it shrinks in the warming of the late Martian spring. Summer will begin in Mars' northern hemisphere on March 30. Conversely, the ice cap might appear to re-grow if the polar region develops a hood of white clouds. Mars came to an apparent standstill against the background stars on Jan. 23. Since that date, it has been in retrograde motion (moving westward) and is approaching the brightest star in Leo, the bluish Regulus (appearing only 1/11 as bright as Mars). 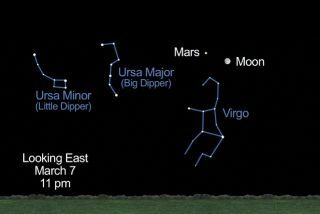 Right now the two are separated by 12 degrees, but they'll be less than 5 degrees apart on April 15 when Mars' retrograde motion comes to an end and it reverses direction and heads back toward the east. If you snap an amazing photo of Mars and the moon, or any other skywatching target, and would like to share it for a possible story or image gallery, please contact SPACE.com managing editor Tariq Malik at tmalik@space.com.